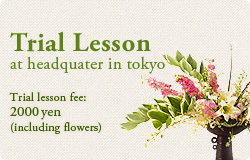 If you would like to start learning Ikebana, why not first enjoy a trial lesson ? You may apply for an Ichiyo Ikebana trial lesson at times that are convenient and available in different locations. Lesson time: 1 hour and 30 mins.